TIFF 2014 Diary: Day 1 | Katarina G.
After a late-but-not-too-late and boozy-but-not-too-boozy night at Cold Tea on the eve of TIFF, I managed to start my festival with a bang. Four movies on the first day feels like a victory and it also feels like a return to what it’s really all about. I got into film because I love watching films. I started going to festivals so that I could watch as many great films from around the world as possible in a short span of time, with the heightened atmosphere of an international community of cinephiles surrounding me in a cocoon of giddy enthusiasm. 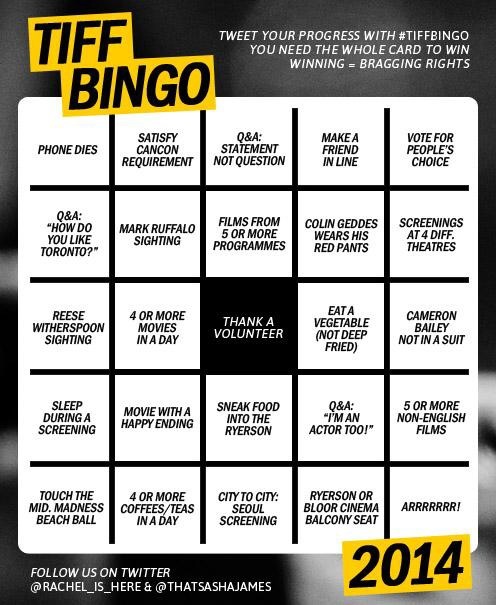 speaking of giddy enthusiasm, I am SO going to get a bingo this year! And yet, and yet. These days, when I go to Cannes or Berlin, I don’t see much. There are meetings, dinners, receptions. There is rushing around and trying to find people and frantic texting. But there is not a lot of time left for films, and that makes me sad. At TIFF, I am not only on my home turf, but I’m also not at a film market – not an official one, anyway, though my sales agent friends might disagree. I feel protective of my own TIFF experience because it’s my hometown festival, the first one I fell in love with, the one I started going to as soon as I graduated from high school. I still want to experience it as a festival, not just as an opportunity to do business. I want to be swept away by the actual power of film. Old fashioned, I know. This year, I started with a bit of Cannes catch-up, with the Dardenne brothers’ Two Days, One Night, an uplifting downer starring Marion Cotillard as a depressed factory worker who’s fighting not to be laid off. Next, Cronenberg’s Maps to the Stars, a bleak film whose premise seems to be that Hollywood is a place for depraved monsters to paint their cruelty upon each other until there’s nothing left. Someone gets bludgeoned with a Genie Award though, and that might be the best use of one of those ever committed to film. In the evening, I go to the premiere of Sunshine Superman, a doc about the delightfully nerdy dude who invented base jumping. It was beautiful, but it did not make me want to jump out of planes, or off cliffs, or antenna towers, or bridges, or skyscrapers. My commitment to terra firma remains, well, firm. My date is the effervescent Sam Horley, an exec producer on the film and England’s most charming film sales person (sorry, everyone else). I hit up a falafel joint with her and some friends post-film and pre-party, then headed to the Sunshine Superman reception, where mac & cheese croquettes are served. I met a couple of Torontonians who aren’t in the film biz, but happen to be friends with someone affiliated with the film. Always refreshing to chat with people at film parties who aren’t schmoozing or hustling, or even necessarily interested in only talking about movies. Around 11ish I jetted off to the Ryerson for the Midnight Madness opener, the Japanese hip hop musical Tokyo Tribe, a film that’s not exactly my cup of tea, but is undeniably entertaining and a fine addition to the cannon of films that make Japan seem like the batshit-insanest place on earth. And then bed, sweet bed, for too few hours before we do it all again.